The principle of “thinking it through” applies to both horse and rider and is a powerful tool if used properly. It is a change from just lunging the horse next to a scary obstacle (which in this case is water) until it is desensitized enough to give it a try. With this method, I need to allow the horse time to think it through before it is desensitized. Let me explain the “magic” of this, how it works and a practical application. 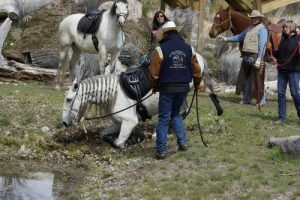 Recently in New Mexico I had an elegant well trained and ridden Lusitano in a clinic that had never put a hoof into water (no matter how hard trainers had tried). Since we were planning on riding down the Rio Grande on the third day of the clinic this presented a problem. Even though the owner was a great horsewoman with a number of titles, when she would ask the horse to enter any water the response was No. The harder she tried the stronger it refused, to the point of becoming dangerous. I was asked to help and, twenty minutes later, the horse was walking through water and crossing a small stream without any issues. He even walked down the Rio Grande. This is how the task was accomplished. First, I established the Bolender Bubble because the horse’s instinct will challenge you in a very powerful way. The brilliance of instinct will move you away from the water in such a subtle manner you will not be aware of it if this boundary is not clearly established. This is not right or wrong, but it is a big safety issue. Don’t take it personally, but your sweet horse will try to run you over unless it sees you are clearly worthy of leadership. Instinct and intelligence are separate; there are many things a horse does without understanding why. That part of instinct is an intelligence beyond what we possess. This is what frustrates and intimidates us—and we don’t even know it! After my leadership was established I asked the horse to acknowledge the water. The horse’s first response was to come into my space. I responded by giving it a good spank on the shoulder. The horse then tried to leave and again came into my bubble. This was met with another spank. I made it clear that my expectation was for him to learn how to navigate water and I blocked all avoidance responses. When the horse understood avoidance of the water was not an option, it began to paw and even got down on its knees. At this point I was patient and let time stand still. I took all pressure off the horse and just let it think. When too much pressure is put on, before the horse has a chance to think, the horse will often leave mentally and/or physically. At this point timing is critical. The horse will need to be encouraged, but not nagged. Nagging is not only very degrading to the horse, it is counter-productive. It is not leadership. Why should the horse listen to one who never stops talking? If the horse is very naughty give it a spanking to let it know that you expect its best try. However, do not get emotional and become aggressive. Be patient and allow the horse time to think it through; show respect for the mind God has given them. This method will seem slow at first, but in a matter of minutes the horse will lock onto the water and attempt to perform the requested task. It is actually a much faster method in the long run. With the Lusitano, time to think it through allowed it to face and overcome the fear of water. My goal was for the horse to become bold and confident in itself. I also knew that when this horse saw me as a leader, its instinct had no choice other than to get up off of its knees and put one foot at a time into that water. It was a fascinating process to watch and so rewarding to see how proud the horse was of its accomplishment. Remember, a teacher inspires while a dictator only intimidates and demands.